Just About Anything: Why Go To Africa? I had been reading the guide book "Stuttgart City Guide" and this line caught my eye and got me all curious: "Why go to Africa?!" Hmmm... Why not? I read on to discover that our city is home to Germany's unique zoological garden called Wilhelma (read as Vil-hel-ma) with its fabulous architecture, and a diverse collection of flora and fauna. Have you seen anything this cute? 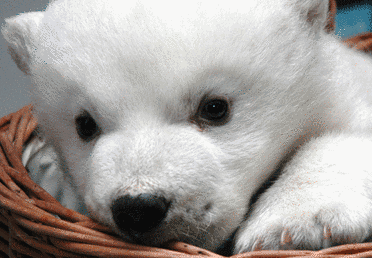 A baby polar bear. And I just knew that we had to go there. And so we went last Sunday afternoon. It was a fine day to start with and a tour around the famous Wilhelma Zoo would truly be a treat. Entrance to the zoo cost 12,00 € each for adults and 6,00 € each for children (6-12 y/o) and students. Me and the sea of tulips. We entered through the main entrance and we were greeted by the penguins and water birds. Sam was still sleeping then so she wasn't able to see her counterparts, errrr feathery friends. Then we passed by a beautiful landscape filled with colorful tulips. Of course, I couldn't resist taking "a few" photos. nocturnal animals, and a vast collection of ferns. Beautiful botanical gardens with flora from the Amazon to the tropics can be found at around the zoo. There is also an insectarium, an aquarium, a butterfly house, an aviary, and of course the many enclosures for the different animals. I'm not sure but I think this is a papyrus flower. Sadly, I wasn't able to take photos from all the areas and houses. My digital camera died out on me again. It seems that the battery is already exhausted from many years of use. Danda! dream ko makakita ng ganyang kadami at kagaganda na flowers. Love the picture of the papyrus flower.You captured the beauty of it.Btw love to exlinks with you dear I’m gonna grab your url now and check my blogroll ha!! !